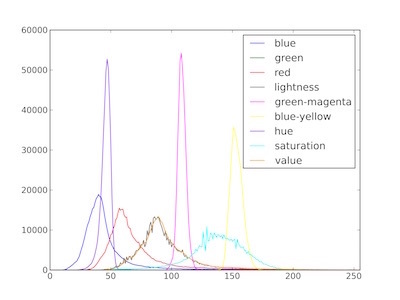 Extract color data of objects and produce pseudocolored images, can extract data for RGB (Red, Green, Blue), HSV (Hue, Saturation, Value) and LAB (Lightness, Green-Magenta, Blue Yellow) channels. hist_plot_type - None (default), 'all', 'rgb','lab' or 'hsv', this is the data to be printed to an SVG histogram file, however all (every channel) data is still stored to the database. Used to extract color data from RGB, LAB, and HSV color channels. 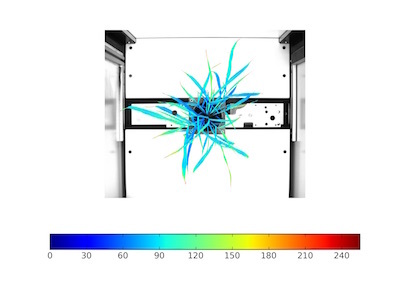 Generates histogram of color channel data.